On September 15th 2011, Sebastian Grimus, a Viennese saxophone player, musician and composer made a list of everything he wanted to achieve in the following seven years. During his long career as a freelance musician, he has worked with numerous big national and international acts – but never finished his own songs. Then, 2018 he finally decided to trust in his vision. producing his own music was still on his mind and layouts of songs on his laptop. 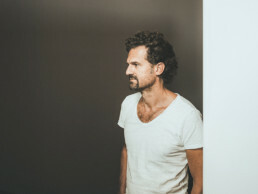 During a trip to New York City, as saxophonist for the band Parov Stelar, Sebastian met the South African band Goldfish. “We were backstage, talking about music and producers we like” said Sebastian. “One of them mentioned Austrian producer Nikodem Milewski and as it turns out he lives only 500 meters away from my home in Vienna.” Naturally, Sebastian got in touch and the two producers started working together. His first single Sign featuring Givven is one of the songs that emerged during this collaboration.